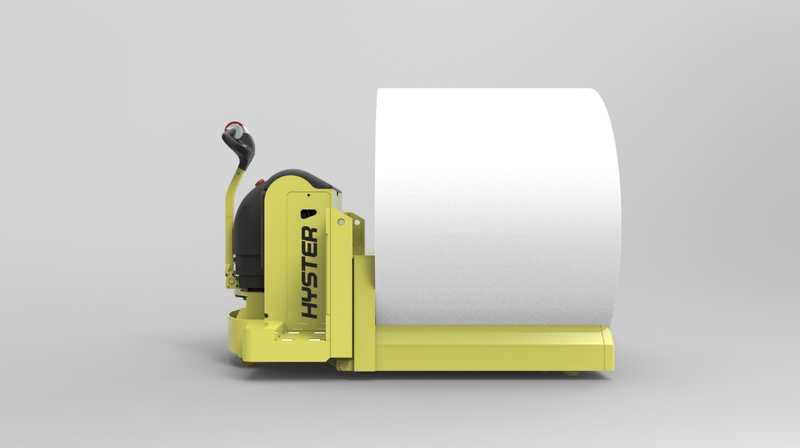 To support paper handling operations, the Hyster Special Engineering Team has developed a reel handling solution based on the P3.0 Pedestrian Powered Pallet Truck. This specially engineered solution makes it possible to effectively and efficiently handle reels of up to 2m in diameter and 3.5T in weight. In paper production storing and transporting reels is commonly required. However, when transporting these loads in and around the warehouse, for storage and onward transport, it is not usually possible to use standard forks, requiring operations to employ specialist reel handlers. The Hyster® P3.0 Pedestrian Powered Pallet Truck with Reel Handler has been designed with a special carriage, the shape of which has been designed to match the shape of the reel flawlessly, which allows the operator to lift and move the reels without damaging them. The reel handler caters to three standard reel diameters: 700/900mm, 900/1100mm, 1100/1500mm and reel lengths range from 1006mm to 2156mm. If operations require, the range of diameters can be expanded with additional overforks bolted to the carriage. This is just one example of how tough Hyster® trucks are designed to meet the specific challenges faced in different industry applications. For more information on the vast range of robust and dependable Hyster® forklift and warehouse trucks visit www.hyster.eu or talk to the relevant Hyster® solutions team about your specific materials handling challenges. This entry was posted in Attachments, Electric, Electrics, Paper Handling, Pedestrian Powered Pallet Truck, Solution, Special Truck Engineering, Warehousing and tagged Hyster Special Engineering Team, P3.0 Pedestrian Powered Pallet Truck, Paper, Paper Handling, paper roll handling. Bookmark the permalink.